Take a moderately intense hike to enjoy the stunning views of the Hollywood sign and LA skyline. Join your expert guide as you discover the area where locals come to get away from it all. 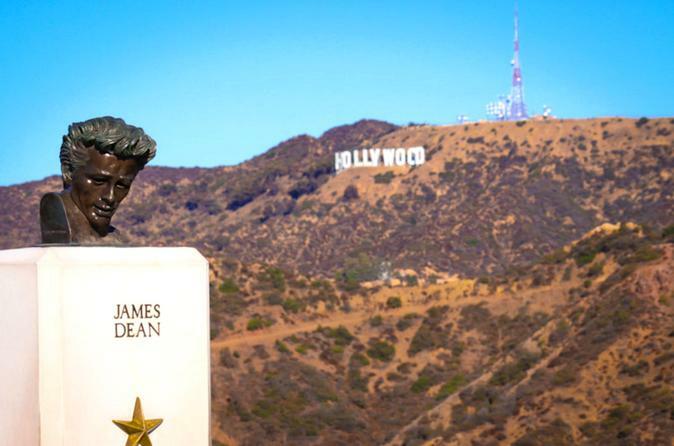 You’ll learn the stories of California legends and hear tales of Tinseltown giants like James Dean. There is no other place in the city with as much tranquility, history and star quality. Enjoy a hike as we ascend high above the hustle for a bird’s eye view of Los Angeles and let your guide welcome you to Griffith Park, a ramble of sprawling green hillsides in the heart of LA. Come with us and discover iconic locations from your favorite films and television shows such as "LA LA LAND", "Who Framed Roger Rabbit", "Rebel Without A Cause", "The Hills", "Charlie's Angels", "Criminal Minds" and so much more. We start our tour at the Roosevelt Cafe where you can grab some water and use the restroom before we begin. We will stroll past the Greek Theater, made famous in the blockbuster movie "Get Him to The Greek", and possibly hear one of your favorite bands warming up for their evening show! We will then go off the paved road and into the “wilderness” of LA for a 30+ minute hike. This short and steep path offers stunning views of the city in all directions. Throughout the course of the hike we will ascend the equivalent of 25 flights of stairs at a leisurely pace and take frequent stops to admire the views and hear about the history of this beautiful terrain. Often there are film crews shooting scenes along this trail, who knows who we might spot? As we approach the belly of Griffith Observatory, the iconic Hollywood sign will come into view and provide a spectacular backdrop to your photos that will make you the envy of all your friends. This tour offers unparalleled views of the famed sign and the incredible Los Angeles skyline. Finally get close to the stars when we visit Griffith Observatory, LA's renowned astronomy museum, with its sweeping terraces. The building is an Art-Deco masterpiece that is considered the “hood ornament” of Los Angeles and is a beloved institution among the locals. You will have the option of entering the building after the tour (free of charge) or take the short hike back with your guide.